From the Archive: A British Television Blog: House of Cards: To Play the King Part 4 AKA How I can be wrong! House of Cards: To Play the King Part 4 AKA How I can be wrong! If you have not seen any of the House of Cards series, please note that these articles are very spoilerific and I will give away plot points. If you do not want to be spoiled please do not read further or read at your own risk. I am not a too proud of a man to admit when he is wrong. Most all of my guesses about what was going to happen to characters in To Play the King were completely wrong. Where I had some pretty strong ideas about what was going to happen with Mattie’s tape recorder and a number of the characters were quite off, I am a little disappointed because it was clear that things were more straight forward than I expected them to be in this series. That is not to say I did not enjoy the outcome of To Play the King, it just means that I was overthinking the whole damn thing. I almost feel like I fell into the trap of current TV thinking things had to have multiple twists and turns to be enjoyable and that is simply not true. For the past four weeks, I have been treating myself to the second series of one of the greatest television programs I have ever seen. Because it has taken so long to see this second series (5 years) it feels like an epic sequel in the making. Now after all of this time, we come to the end of To Play the King. 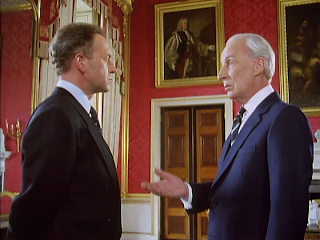 As we left off last week, it looked like it was going to be the final battle between the King and Francis Urquhart. It’s not quite as epic as I would have thought. In House of Cards, Urquhart had a quiet ruthlessness that was shocking yet addictive to watch. As mentioned last week, in this series he is kind of a thug or a mob boss. He squared off against the King. It is dangerous for him as he has now called a general election. We start the episode with Sarah and Stamper negotiating with a person within the BBC what is the best way for Urquhart to interview on TV. It almost looks like Sarah and Stamper are getting along. They actually work very well together even though they have issues with each other. Stamper is clearly jealous of her since she is working very closely with Urquhart. Stamper has not gotten much luck out of Urquhart lately. He does all of Urquhart’s horrible deeds such as blackmailing other people for Urquhart’s gain yet he is not getting the positions in the government he wants. Later when the Prime Minister is alone, Corder and Elizabeth come to see him. It looks like Corder is going to speak to Urquhart and is about to take something out of his suit coat pocket when an explosion is heard and rocks 10 Downing Street. Everyone in the room is unsure of what this is and as Corder says, “It’s not one of ours.” In fact it is a block of flats that suffered a gas explosion. On the way to the scene, Urquhart tells us that it is always Events that get in the way of running the government. Events, such as this gas explosion, where Urquhart would prefer not to meet people but to instead run the government. At the scene it is total destruction. Many are dead. The King is there too. Urquhart and the King exchange some tough words and as a rescue worker near them loses their hold on a stretcher carrying a body, the King run downs to them and says, “Please, let me help.” This moment is captured by the press and this phrase captures the imagination of the country. “Please Let me Help.” There is a swing against Urquhart and public opinion starts loom against him. The King starts to get more confidence. While the King is working out in Buckingham Palace, Chloe comes in. She is getting braver with her suggestions to him. She knows that he trusts her and much of the way he is now seen by the public has been helped by her suggestions. She suggests that the King goes on a “National Tour”. He should go to areas that Urquhart would never be seen in. He could show the country that he really cares for his people and that he is a stark contradiction to what Urquhart stands for. This way, it could also bring more support to the people that are running against Urquhart. Chloe then kisses the King. 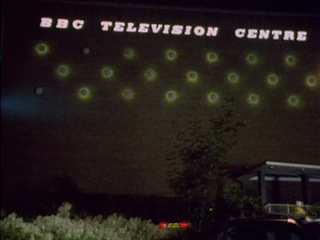 As you know, I always like to see BBC Television Centre in programs and it makes an appearance in this episode. Urquhart has a television interview. Because there are a lot of homeless and jobless people in the UK, Urquhart announces the return of conscription. This is the practice where when youth turn 18 they go into military service. I did an article about a comedy series based around conscription here. Even more interesting is that when we did an article on Yes Prime Minister, Prime Minister Hacker was all set to bring back conscription. That episode guest starred Frederick Treves who played Chief of Defence in The Grand Design. 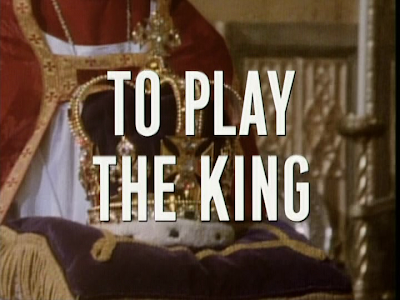 In To Play the King, he played Lord Quillington. A lot of pressure is applied to Urquhart because it is believed that the reason the block of flats exploded was down to how bad things have gotten under Urquhart’s leadership. It is found out that the explosion happened due to someone trying to steal the gas for his flat and botched the job. Urquhart was able to announce this in the interview which helps is election immensely. The King’s Chief of Staff David Mycroft is having issues of his own. After leaving his wife, he is living the life he always wanted. He is gay and he now has a boyfriend. The press knows about this and is starting to hound him. It is during this tour that Mycroft announces to the Press he is a homosexual and that he is going to resign from being Chief of Staff thus no longer connecting himself with the King. The national tour starts, with very little security for the King, and they go to multiple places. The reason there is so little security is that the King wants to show he can move among his people and does not fear walking around in his country. Urquhart is watching this with great interest. He has a plan. Corder thinks it could be a good idea to blow up the car the King is riding in. They are all very nonchalant about it. Ultimately, Urquhart knows what to do. When the King goes to another low income area, it is easy for the King to be whisked away by a group that looks like they are going to hold him hostage or even kill him. Then suddenly, out of nowhere troops pour out of everywhere and save the King. Of course all of this was orchestrated by Urquhart including the people who were going to kidnap the King. Publicly it is stated that Urquhart himself made sure troops were around in case anything were to happen to the King. 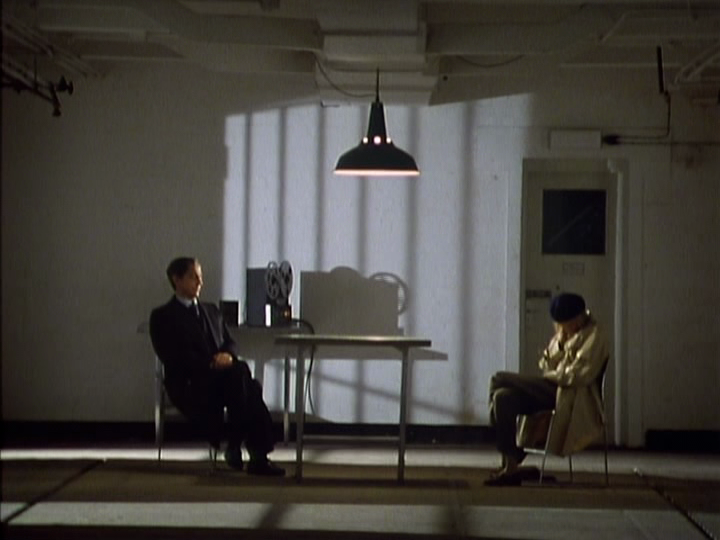 The King looks naïve and Urquhart looks very smart for thinking of the King’s wellbeing even if the King can’t do that himself. Much to my horror I watched Sarah Harding walking down the street at night and get abducted. It was the same people who roughed her up in Episode Two. Why does she walk those streets at night? Anyway, she is brought to a garage area and is met by non-other than Stamper. The next scene is Stamper and Sarah listening to Mattie’s recording. Stamper had the tape recorder! One of his people got it after Mattie was thrown from the roof and returned it to Stamper. So not only was I wrong about who had the tape recorder but I was also wrong about who ordered to rough Sarah up in Episode Two. I thought it might have been Urquhart himself to get Sarah to feel sorry for him. I was very, very wrong. The reason Stamper wanted to share the recording with Sarah was because he was worried that if something happened to him that a copy could exist and be turned in. Stamper knew that Sarah was investigating what happened to Mattie especially since Stamper was the one anonymously leading her on. Stamper also was angered because Urquhart wanted to keep Stamper at the Chief Whip position. Urquhart had been very disrespectful to Stamper and did very little to help Stamper with the general election. Stamper wanted a higher and cushier job in the government while Urquhart like Stamper where he was because he was so good at bullying people. It’s kind of odd since that is what set Urquhart down his path of destruction in House of Cards. When Urquhart was Chief Whip he helped Collingridge win that election and was promised great things. Immediately after the election, all of Urquhart’s ideas were cast aside and there was no promotion for Urquhart. It looks like Urquhart will win the general election. The night before the election Stamper meets with Sarah to let her know that when Urquhart is named Prime Minister again, he will go into the police and hand over the tape. All throughout To Play the King we have seen listening vans eavesdropping on conversations. This was happening right now to Stamper and Sarah. A call comes through to the Prime Minister’s bedroom in the middle of the night. Elizabeth takes the call. Elizabeth and Urquhart sleep in the same room but in separate beds. Elizabeth sits Urquhart down and explains what is going on. Watching it, it is strange that finally Urquhart knows about Mattie’s recording for the first time but I, myself, have known about it for years. It was a strange moment for me. Elizabeth tells Urquhart that both Stamper and Sarah must be eliminated. I still think there is more to Elizabeth than we see. As Urquhart agrees suddenly I find myself sadly counting the minutes to the death of Stamper (who is a stellar, stellar character) and Sarah. Urquhart doesn’t want to kill either of them but he feels he has no choice. The scary thing is that although Urquhart wants the power, he truly believes he is the only one to bring Great Britain back to its former glory. To achieve this goal, it is necessary to kill. It is for the good of the country. Urquhart’s government wins the election and his first stop is Buckingham Palace to see the King. This is not a visit for congratulations. The King doesn’t realize it at the moment but the only reason for Urquhart to stop by is to tell the King he must abdicate the throne. The King doesn’t think he has to do so. 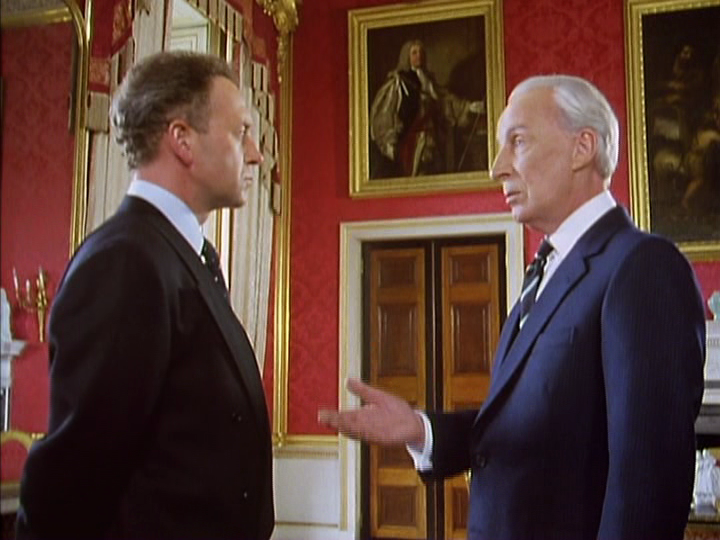 He even says, “All you want to do is destroy the monarchy” which Urquhart replies, “No sir, It is you I wanted to destroy, not the monarchy.” He then goes on to tell the King why he must abdicate. Not only that but Urquhart verbally destroys the King. The King is finished and he knows it. The scene is great because Urquhart is able to tell the King exactly what he thinks of him in a calm measurable fashion although this has been building up ever since the King had been crowned. The King tells Urquhart, "Your a Monster, Urquhart!" to which Urquhart replies, "You might very well think that sir but your opinion doesn't count for very much now, does it?" What about Sarah and Stamper? As Stamper pulls into Scotland Yard to hand over the tape, his car explodes killing him. Sarah was almost smarter. She phoned Chloe, who she met briefly before, and wanted to arrange to meet her so she could give her a copy of the tape for safe keeping. She doesn’t tell Chloe what she wants to hand over. Chloe is going to meet at Sarah’s house and is standing with Sarah’s husband as Sarah drives down the street. Sarah’s car explodes too killing her instantly and the tape copy. Urquhart has the perfect alibi as no one knew there was any trouble with Stamper and Sarah and it simply looks like the IRA targeted two of Urquhart’s closest advisors. As I mentioned in the previous three articles, I really enjoyed this but I preferred the style of House of Cards. This shows that Urquhart created a very thug and crooked government. In House of Cards, it seemed like he was working on his own and forcing people to help him. In To Play the King, it is obvious that Urquhart is an elected tyrant and uses fear to make people do what he wants. It will be interesting to see how far he goes in The Final Cut. Sadly, although shot on film this series was edited on video. I was hoping at some point that all three series would be available on Blu Ray. Unfortunately that seems unlikely. The original film elements would need to exist and although that is not impossible, it is highly improbably. All the film would need to be re-transferred in HD and the episodes put back together again. It wasn’t shot on 35mm film; it was shot on 16mm. It would still look great but not as good as 35mm. It seems like this would be a great series to get a re-master of someday. Does the King abdicate? He certainly does. 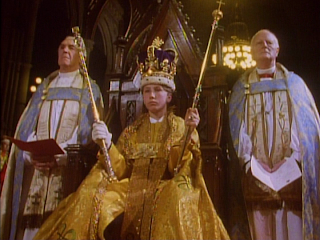 This wholes series based the Royal family on the real Royal family. The King was very much like Prince Charles and the Lady looked very much like Princess Di even down to hair colour and hair style. They were separated from each other. The Royal couple in the series only had one teenage son. 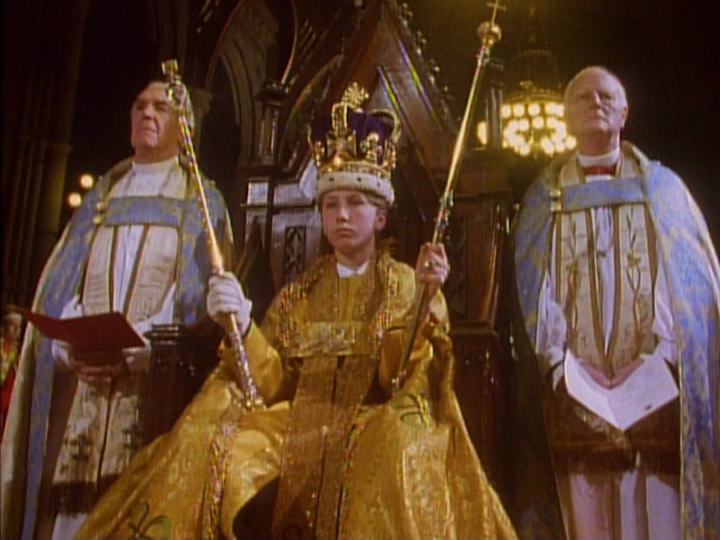 As the end credits roll, this teenage boy is crowned the new King of England. The sad thing is that the King was only trying to make his country better. I knew before I started to watch that this was a battle of wits between the King and Urquhart. What I didn’t realize was the King was actually a very reasonable person. My idea on how this series would unfold was very wrong. The King’s views were naïve but he wasn’t a bad person. Now Urquhart got everything he wanted. The King is out of the way and his teenage son now holds the throne. 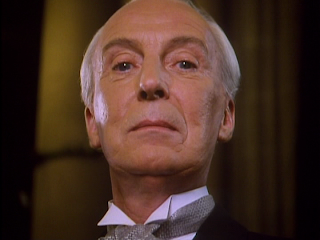 I doubt it is too much to assume that we now have a King that can be easily molded by Urquhart. It doesn’t appear he will have any interference from the throne. Of course, we will only know that when we someday watch the final story, The Final Cut. Next week: I am very bored writing about Francis Urquhart for the past four weeks. It is time to go into outer space. How about to the moon? Let’s take a look at the 1973 series Moonbase 3. I will look at episode 3, Achilles Heel. We can see if Barry Letts and Terrance Dicks have the same luck with this as they did with Doctor Who. 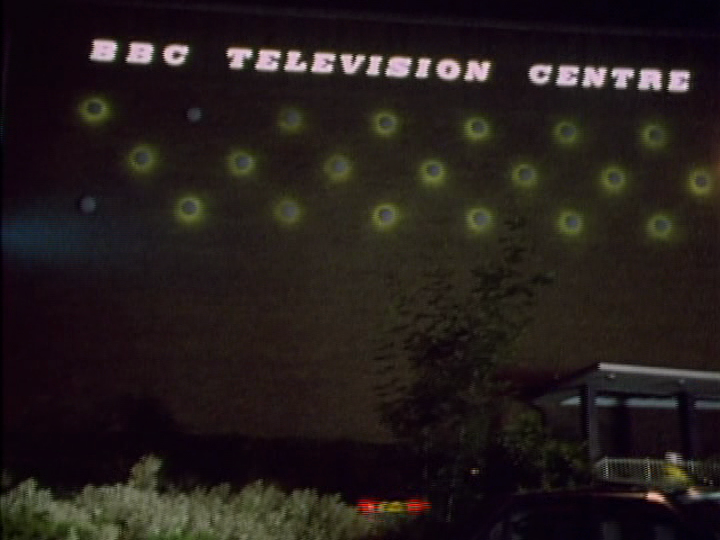 Also please subscribe to my From the Archive: British Television Blog Page for updates about new articles. Even though you were wrong with your guesses, I am sure it was worth the ride. Sometimes you just have to sit back and enjoy the show. Anyway, I look forward to the next installment. To the moon, Alice, to the moon! Trust me, I am more laughing about how wrong I was. It is quite amusing. As much as I enjoyed watching it and writing about it, I am ready to focus on some other stuff. I have some pretty cool stuff I am going to write about in the next 3 weeks. I still don't understand why the King felt he had to abdicate. Are there strict rules about the monarchs not getting involved in social issues or something? (I'm American). I could see if Francis U. had drummed up some kind of horrible financial scandal or something like that. I think it would be very unsettling for the monarchy to be seen disagreeing with the government. The Monarchy does not run the government so they would be at odds with it which could inturn start unrest amongst those people who would like to see the monarchy made unconstitutional. It could start a domino effect that could finish off the monarchy once and for all. Urquhart could have set his sights on not just the King but the entire monarchy but decided to make the King abdicate so Urquhart could have an easier time of running the government with a younger more inexperienced King. Found this blog after googling about the series because I had essentially the same question as clongworth after watching the series (I'm also American). I think the writers kind of dropped the ball at the end. It didn't seem like FU had enough leverage over the King to demand an abdication. I'm assuming that the King had not actually violated the law, please correct me if I'm wrong. I also don't think the domino effect argument would be quite strong enough because if the King could be held in check out of fear of a backlash, then he wouldn't have gotten involved in politics in the first place. As for the possibility of inciting the anti-royalists, it seems like the die was cast as soon as he made the TV show. Since FU had already met with the King's wife and reached an implied agreement that she would betray the King to ensure that her own son would have the throne one day, it seems like FU should have gone into the King's office to demand abdication while holding something over him and essentially making it a case of "do what I say or I bring down you, your son, your marriage, and the Monarchy forever". Since the writers never paid off the kiss between Chloe and the King, plotwise, it seems like there was a scene missing where Corder obtains proof of the King's implied infidelity and brings it to FU. FU could then bring it to the King's wife and promise not to bring down the monarchy permanently if she would, in exchange, threaten the King with a messy public divorce if he doesn't abdicate. FU could then approach the King with a fait accompli: go quietly and your son gets to be King or we go public with this and use the scandal to end the royal family once and for all.